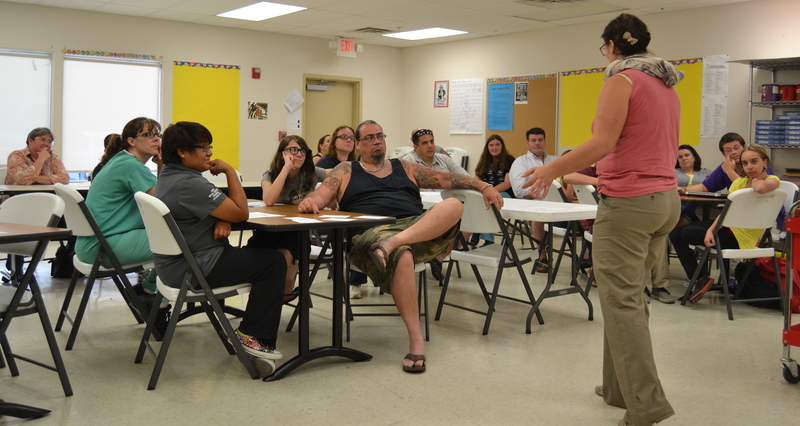 — Project Manager Emina Slavnic speaks with parents about her courses during Curriculum Night. — Aside from the late start, Thursday’s Curriculum Night was a success. Once a year, parents come to the Academy and follow their scholar’s daily schedule, meeting the project managers and learning about the school’s curriculum. Every manager had a different way of talking about his or her class; for instance, math teacher Emina Slavnic used a meter stick to demonstrate her grading scale, while Ray Nance explained that participation is the majority of the grade in his class. Parents also got a taste of what music scholars are dancing to in between classes. She said the only information she found missing from some of the presentations was how parents can help their scholars.